Convenient Electronics Recycling Pickups and Data Destruction Services by All Green Recycling made available now in Vernon, California. Recycle your old electronics responsibly because this process can help Mother Earth avoid environmental issues. Our ITAD solutions are ISO-certified. We have crafted e-waste recycling services with benefits for you. Destroying sensitive data and information should be done carefully. Thus, count only All Green Recycling. A complete destruction of obsolete, defective and recalled tech items is important for your business growth. 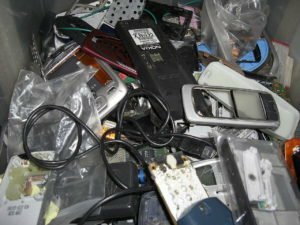 Recycling old electronics is now easy and efficient with the help of a top-notch company in Vernon. All Green Recycling provides working and helpful e-waste management solutions. People here can now benefit from their stored EOL IT equipment. Let us collect your items and bring them to our world-class facilities as we treat and process them through our Electronics Recycling Vernon Services. Our IT Asset Disposition Programs will see to it that no single electronic device will be thrown away and deposited in the landfill spaces here or abroad. Our drive is to focus on providing high quality and premium e-waste management services. This is an industrial city located in Los Angeles County. It is the smallest incorporated city in California, with 91 residents as of the 2000 census. Five miles (8.0 km) south of downtown Los Angeles, California, the population here in 2010 was only 112. Thus this is the the smallest of any incorporated city in the state of California. This location has industrial area because there are meatpacking plants and warehouses here. When sensitive and confidential data are not destroyed, they could risk your business operation. So taking good care of them by way of having a fully secure data destruction, hard drive shredding, and equipment destruction is important. Failing to destroy the non-public files can cause hundreds of thousands of dollars in damages and a permanently tainted reputation. Don’t let your data security be risked out of carelessness. Secure your brand today. Why You Need to Tap Vernon E-Waste Recycling? Schedule a pickup or find a drop-off location because this is the only way for you to reach us out and to enjoy our programs and services. Don’t throw your e-waste products in the garbage bins because they are toxic and can therefore harm the environment. Conserve natural resources through our e-junk management solutions. Contact us today for more relevant information and details.